Grape, which is genetically identical to our California Zinfandel. The vines are not irrigated and depend on what moisture their roots can find deep in the limestone soils. The concentration of these red wines is incredible. Some are so dense that they must be blended with wines produced from vineyards located in less stressful conditions to make an approachable wine. A delightful fragrant white wine made from the Posip grape comes almost exclusively from island of Kortula. The grapes are grown on the island and shipped by boat to wineries on the mainland. Through the hospitality of our hosts, Andro Crvik and his family (Crvik Winery), we were able to visit many of the wineries in the area. The next part of our European wine adventure was is the Rhine region of Germany. 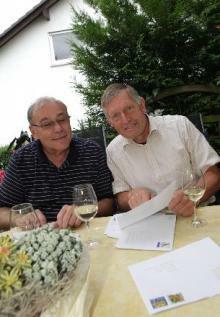 This time we were taken in and hosted by Heribert and Sybille Erbes. Their winery in the village of Spiesheim (Weingut Erbes, Rheinhessen) has been in the family since the 1600’s. I learned a great deal about German wines from Heribert. Like in Croatia the perhaps most important element in making top quality German wines results from the meticulous care of the grapes. In our travels we were treated like family by our winemaker hosts and established relationships that will last a lifetime. The most important lesson I learned as a winemaker is that no matter where you make wine, producing the best grapes is the key to making the best wines. This entry was posted in Wine Musings and tagged California, Etienne, Germany, Heribert Erbes, red wine, Rhine Region, Temecula, travel, United States, white wine, Wilson Creek Winery, Wine, Winemaker. Bookmark the permalink.